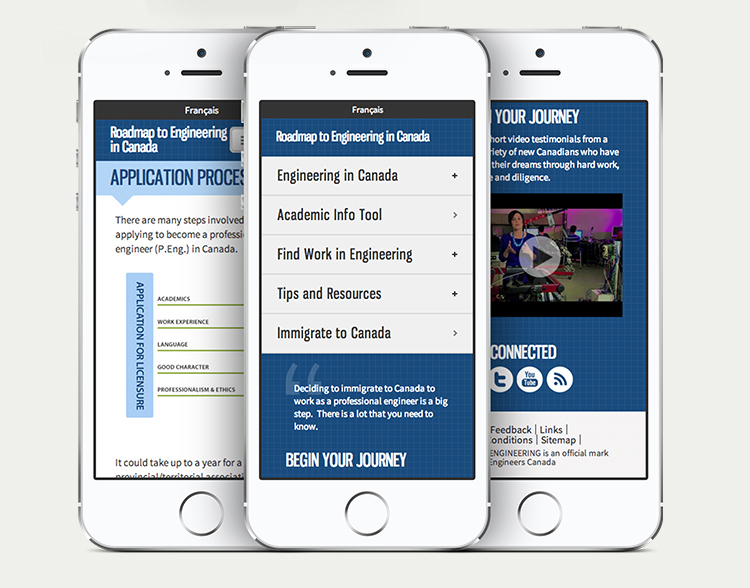 Engineers Canada requested the development of a new microsite in May 2012 to support its International Engineering Graduates (IEG) Roadmap project. The site would provide key information and resources to international engineering graduates that would help them integrate into the Canadian workforce. The goal of the Roadmap to Engineering in Canada microsite was to provide a simple, primarily visual user interface design for multilingual users, while at the same time adhering to the Federal Government’s standards and guidelines for web accessibility. 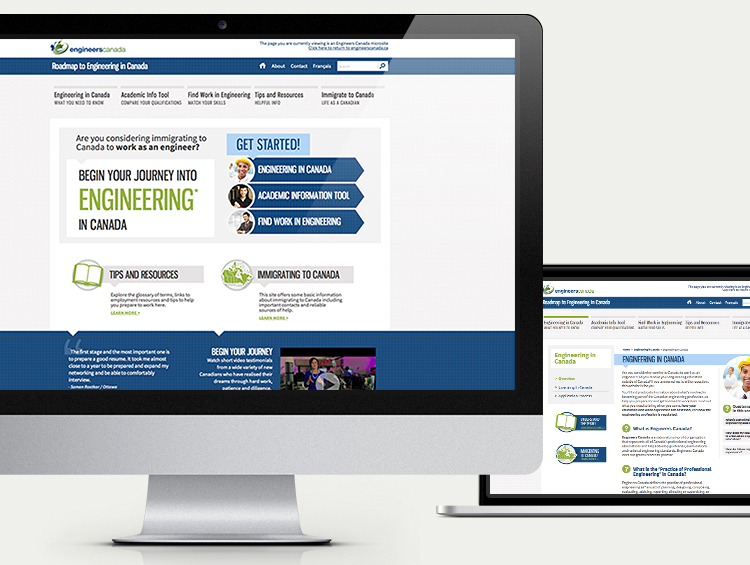 Industrial helped Engineers Canada develop a strategy for the microsite that would inform and impact its global audience. Beginning with the information architecture (IA), Industrial designed a site that would easily allow users to navigate to the valuable tools and resources that Engineers Canada maintains. Wireframes were used to mock up an interface for the information contained within the site, and a highly visual user interface design concept was created that would communicate action to the users, simplifying the interface for non-native English and French speakers. Engineers Canada and Industrial went through multiple rounds of testing and several iterations on the initial design to ensure the best possible user experience. 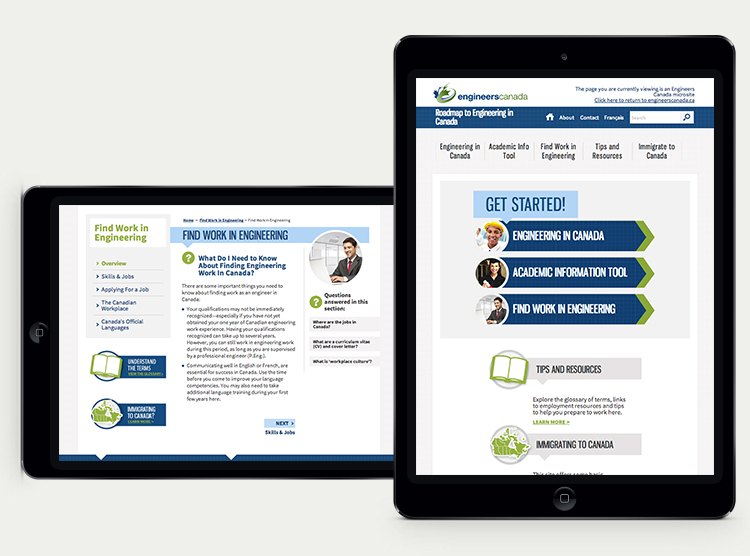 Before and throughout the launch of the Roadmap to Engineering in Canada microsite, Industrial administered training on the Drupal Content Management System (CMS) used for the site, and supported the communications team at Engineers Canada as needed. Monthly progress reporting post-launch has allowed Industrial to help Engineers Canada with further enhancements to the site and optimization of its content to maximize exposure. A major win for Engineers Canada was the integration of a .Net application into the Drupal CMS that has allowed its users to cross-check their degrees against Canadian equivalencies. The Academic Information Tool provides its users with a dynamic search interface that pulls from information in an SQL database. Industrial also learned new approaches for accessibility through this implementation, including accessible drop-downs that allowed for the use of screen readers and keyword navigation.